Vices. We al have some, right? Come on, admit it. A few years ago, I started using a well-known website forum about watches. One of the threads that caught my attention was all about the “cigar/watch lifestyle.” At first I thought it was odd, but then I noticed that this was the most “active” thread on the entire website. Basically, guys post photos of themselves smoking fancy cigars while wearing expensive watches. 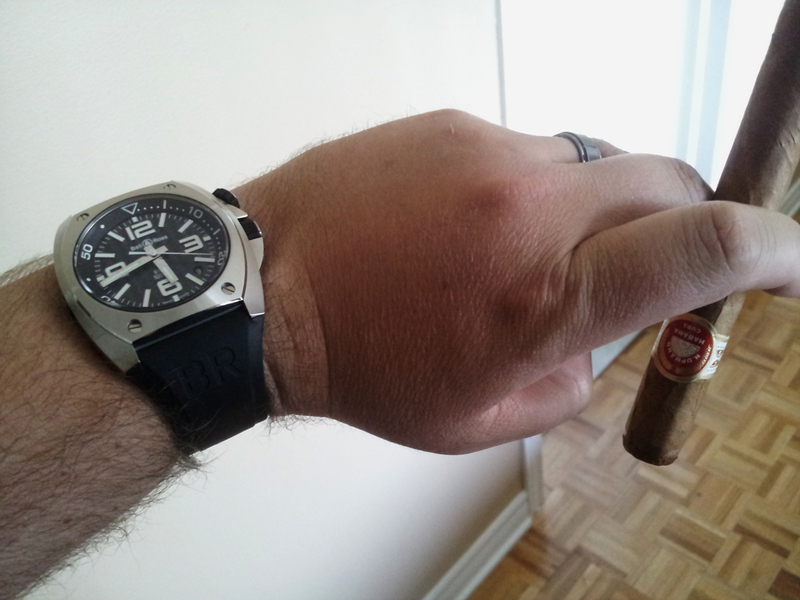 The key is to capture both the cigar and the watch in the same photo of your left hand. I thought it was fairly cool, but I didn’t really understand. About two or three years ago, I was golfing with one of my watch buddies (the same guy with the big bad Bell & Ross) and he initiated me into cigars. I had always hated cigars and smoking. In fact, I despised them. On the golf course, however, in the right context, I found that a cigar can be incredibly satisfying and enjoyable. Over the past year or so, different friends have taught me about cigars and shared some fantastic smokes with me. I have learned that it’s all about context. A cigar demands the right occasion, the right weather and the right location. Now, most cigar guys are into scotch. I don’t really like scotch – I prefer port with my cigar. Or brandy. But a nice scotch is OK if you’re having a fine cigar. Once again, it’s all about context. Back in April, I went to a resort in Riviera Maya with my wife and baby daughter. It was paradise. 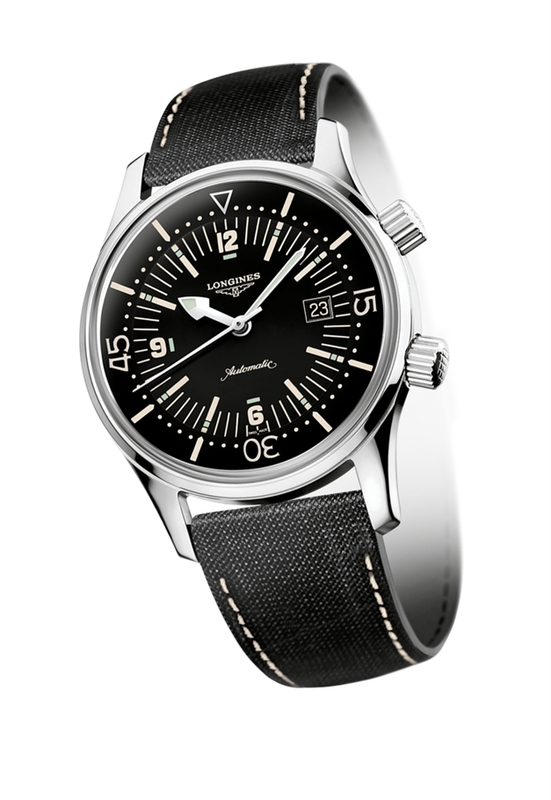 I had decided to wear a piece on this vacation – my Longines Legend Diver. Skeptical about actual waterproofness of the material strap, I was dying to try the LLD in the water. It was great, by the way. I could blog about it. The LLD is a retro 1960’s style diver – perfect for a beach resort. The resort had a fantastic outdoor plaza with bars, shops, discos, and… a beautiful cigar store. My wife agreed that I could enjoy a nice cigar from the store… ONE time. So one beautiful evening, my girls went to ride on the carousel while I anxiously walked into the store. I chose a big, fat Monte Cristo. I sat outside the store at a table and they brought me a glass of brandy. I leaned back, wearing my Longines, and puffed and looked up at the stars in the Mexican sky. I sipped my brandy and admired my wonderful timepiece. The Longines looked amazing at night as I puffed slowly on my cigar. It was a moment of zen. My wife and daughter were having fun, laughing. We were in paradise. I was kicking back and enjoying three indulgent pleasures – a drink, a great timepiece and a fine smoke. And that’s when it hit me. The cigar/watch lifestyle. I got it! I totally got it! Why do cigars and watches go so well together? And drinks? They are all luxuries – man’s luxuries. They are unnecessary pleasures. Indulging in these pleasures is a treat – it’s a pat on the back. It’s something you enjoy on vacation, on the golf course or on a long weekend. And I think this is at the heart of the watch culture in general. It’s all about luxury. Rewarding yourself. Unnecessary pleasure. So go out and reward yourself this weekend.